Family Reserve cigars have been released once each year beginning with the company's 44th anniversary ~ all leading up to the Padrón Family's 50th Anniversary in 2014 and the commemorative Family Reserve No. 50 cigar. The Padrón Family Reserve No. 85 (aka Padrón Family Reserve 85th) celebrates the 85th birthday of the company's legendary founder José Orlando Padrón. Padrón's Family Reserve No. 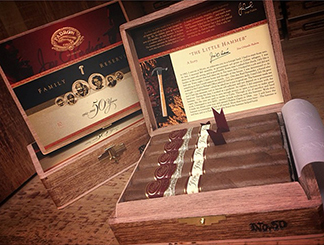 50 is a full-bodied, pressed robusto blended with select leaf aged 10 years. This rich, smooth, and well-balanced cigar lives up to its status as the Padron Family's marker of 50 incredible years producing spectacular premium cigars. Available in natural and maduro. The Padrón Family Reserve No. 46 is a pressed, dark corona gorda made with some of the Padrón's oldest tobaccos. Selected from approximately 1,000 test cigars, it is a rare and refined smoke. Available in natural and maduro. The Padrón Family Reserve No. 45 is a pressed toro. Stronger than typical Padróns, the No. 45 provides for a rich, hearty smoke full of coffee notes and spices. Company president Jorge Padrón says the tobacco leaves inside the No. 45 are as old as 10 years. Available in natural and maduro. Padrón Family Reserve 85th cigars are pressed, medium-bodied Nicaraguan puros full of richness and flavor with notes of pepper, spice, leather, and chocolate. As with the entire Family Reserve line, this cigar is an absolute pleasure to smoke. Available in maduro.